Schooling from the heart: "Giving Love"
Lately I've felt like there has been a tornado following me around the house. As soon as I pick up one room and move on to the next, WHAM! The tornado hits. Everything I do is very quickly undone. I know you understand what I'm saying... toys, paper, books... anything really, just manages to spray itself in all directions as if some unseen force were testing the limits of my patience. I can't manage to clean fast enough. What's really interesting is not the tornado phenomenon that seems to accompany any house with small children. That's pretty standard fare, I think. What fascinates me is that no one else in my house seems to notice it. They walk right through a room or two and don't give the effects of this whirlwind a second glance. It's as if they don't even notice that it's there. How could they not see it? Now, I'm not a neat freak. I'm pretty side-tracked a lot of the time-- the mail piles up until I have enough time to sort it and decipher it to see if it's important (this always involves the German dictionary or an internet translator). I do happen to leave knitting projects and half-finished books laying around. I'm always getting up in the middle of a page or a row to tend to somebody's needs, so a little bit of a mess doesn't bother me. It's the five puzzles that manage to be strewn across the floor before I can blink. It's the clean bathroom that's suddenly covered in mud. It's the food that spontaneously flings itself off the table, just after I mop the floor. It's never-ending. I know you're not stopping by to hear me nag. Ugh. I don't want to hear it either. But I do want to share something interesting I discovered. The reason it seems that nobody notices the mess is that, really, nobody does. I finally asked them, and no, they don't actually see it. Should I have expected this answer? I don't know. But I was truly taken aback. So I did something crazy. I asked the kids to accompany me on a tour of our house, starting at the front porch. I told them the rules were that they were not allowed to do anything but look. And while they were looking, we would ask ourselves one important question: Does this house look loved? They caught on pretty quickly, and they were shocked by what they discovered when they opened their eyes and looked at it from that perspective. They each, even Kitty Bill, discovered a myriad of things they had forgotten to put away. Not being allowed to actually do anything but look at those things was torture to them. They were jumping at the bit to do the right thing. But no, I wouldn't let them. Does this house look loved? It was a resounding no. When I finished torturing them with my walkabout I asked them to sit and watch me "give love" to a room. It was a comedic exercise, really, because I stood around and just looked at things. I picked them up and pondered them, and put them back down. I pretended that I had no idea what to do. Soon enough the kids started shouting out helpful suggestions on where I should start and what I should do. It was hilarious! They had such a hard time watching me play dumb, and I had to stop them several times from getting up to help me. Once the fun and games were over, I let them choose one room in the house that we could all give love to, together, for a few minutes. They were so happy to be able to lend a hand. For the first time in awhile I didn't have to point out the things that needed picking up. They actually saw them! Sunburst then suggested that they should start helping out with regular chores, rather than random ones, so we sat down and came up with daily chores that I would definitely welcome some help with. 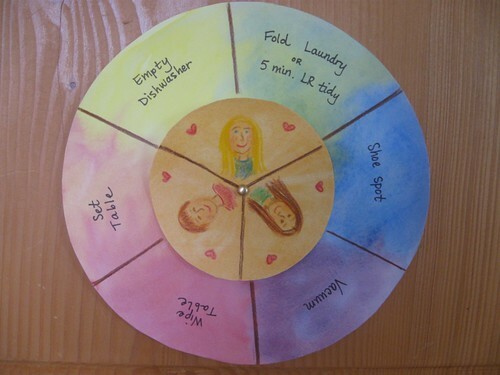 I applied some waldorf-voodoo to our chore wheel, pictured above, with watercolored paper and Lyra pencils. The kids are rotating the circle every Monday. They can all lend a hand to some degree-- and even the smallest hand is fine by me. You just give the amount of love you can. No more, no less. At the same time I decided to re-institute the reminder list for each child. I tend to remake these every few years, especially if the youngest child is having a hard time remembering to run straight to the toilet in the morning. The list actually helps with that, among other things. 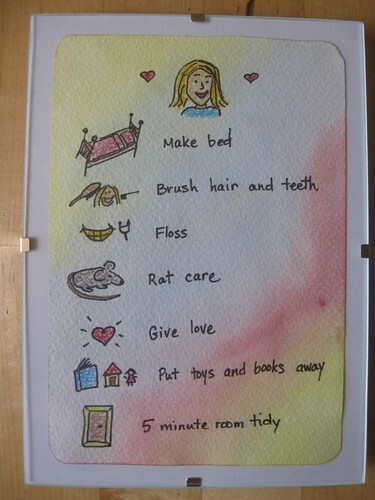 It reminds them of the things they need to do to help take care of themselves and their things. Loving the world starts with loving yourself. I tack the lists up near their beds, but this is the first year I framed them. The kids are really delighted with them. Sunburst especially. Give a choleric child a list and they can't help themselves. It's a challenge to them, and they will rise to meet it. Phlegmatic children, however, are not so easily motivated. But we're trying. We keep trying anyway because it's important. And it's the only way we can keep the tornado at bay. With love. Always love. What a great idea! I'm going to give this a try in the morning with my family! Thank you for sharing! beautiful creations! i hope they help to bring beauty and more love to your home. ;) i need to try some waldorf voodoo on a chore chart for us! I love your artwork and beautiful ideas! Awesome and inspiring post! My house has the tornado effect, too, but it's so hard to toss things as you always seem to find something creative to do with the bits and pieces. I have to try your "does this house look loved" bit - how creative and fun you are, bringing laughter and really awakening the children by not slamming them with complaints of the mess! Well done and thanks for these awesome suggestions - love your charts! I love this post so much. I hope you don't mind but I put a link for it on my blog's organization page for blogs with chore helper ideas. Thanks. What a great tactic! I think I do that in earnest - wander from room to room looking at the mess and not knowing what to do. Mess really does confuse me. My solution is to have as little in the house as possible, the more sparse the less cleaning but my boys could easily make a completely empty room messy in no time! Really love your ideas. Such a great approach. 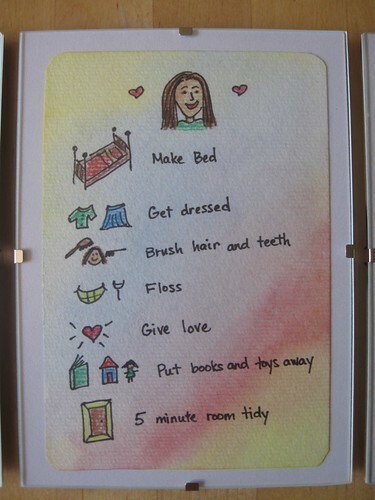 I will need to try something like this instead of moaning and gazing about. What a lovely idea! I wonder if it would work with my 22 year old, her end of the house really does not look loved at all! how wonderfull! I love the lists. My sons (especially the eldest with Asbergers) need constant visual prompts to get through the day. 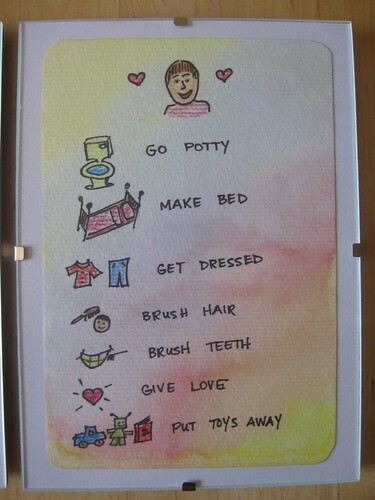 I love your list and may well be making the boys one each! I will also be taking them on the "Is this house loved?" tour. What a fabby idea! !